Massachusetts bodybuilder Moustafa Ismail eats 7 pounds of protein, 9 pounds of carbohydrates and 3 gallons of water each day to help maintain upper arms that measure 31 inches around (as big as a small man’s waist). Skeptics say there must also be steroids or some other artificial means behind Moustafa Ismail’s beyond-bulging biceps and triceps, and Guinness World Records is wavering on whether to recognize him. But Moustafa Ismail insists they are all-natural, the result of a punishing workout regimen he started after a guest at his uncle’s wedding in his native Egypt mocked his overweight frame. “They call me Popeye, the Egyptian Popeye,” Moustafa Ismail, 24, said while working out in the Boston suburb of Milford. It’s not easy having the world’s biggest arms. Generous amounts of poultry, seafood and shakes provide the protein he needs to fuel daily two-hour workouts in which he lifts as much as 600 pounds. He also takes mineral and vitamin supplements and drinks plenty of water to flush out his system. Then there’s clothes shopping. The rest of Moustafa Ismail’s body is average, so it’s a challenge finding shirts that fit his arms without making him look like a little kid playing dress-up. Not to mention the controversy that ensued when Guinness decided to recognize him as having the largest upper arm muscles on earth and critics accused him of using steroids or other artificial methods. He lost a night of sleep but then decided the criticism “is motivation for me – it’s not something that’s gonna put me down”. Moustafa Ismail started building his muscles in his Egyptian hometown of Alexandria before moving to the United States in 2007 and settling in Franklin, southwest of Boston. To pay for his gym membership and dietary requirements, he worked two jobs as a gas station attendant, but gave up one after his wife complained that he was pushing himself too hard. Then Guinness called last Fall, offering him an all-expenses-paid trip to London for a signature appearance with the world’s shortest woman and others. He went, but then the controversy started. Strangers claimed online that he used steroids or had implants in his arms. Others speculated that he might have injected his muscles with a synthetic oil substance, synthol, used by bodybuilders to fluff muscle tissues. “It is hurtful,” Moustafa Ismail said, noting that he has no scars that would have resulted from surgery and that supporting a wife in the U.S. and family members in Egypt doesn’t leave him with spare cash to buy pricey synthetic oils. Moustafa Ismail even went to Tokyo to appear in a Fuji TV documentary program in which independent doctors collected blood samples and X-rayed his muscles. They found nothing abnormal, he said. Still, Guinness hastily removed references to Moustafa Ismail from its website. Spokeswoman Sara Wilcox said in October that Guinness was conducting research with medical specialists and reviewing Moustafa Ismail’s category. She did not respond to emailed questions later seeking details about when Guinness would conclude the review and what it entails. 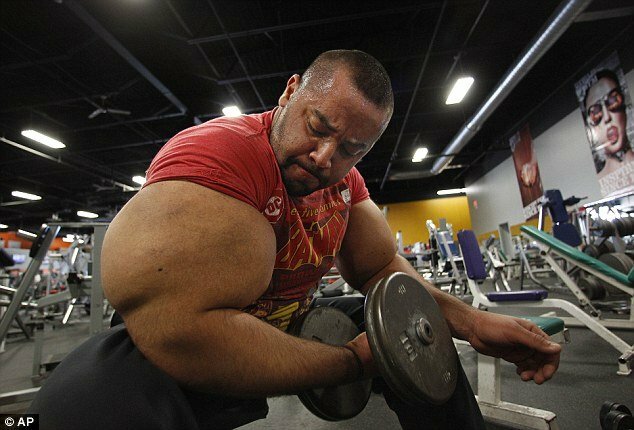 Some fellow amateur bodybuilders at his gym, however, support Moustafa Ismail and say they believe his arms are natural. “When I first saw him I thought <<Oh my God, he’s a freak>> – the big Popeye arms, he’s incredible, but he works out hard, so good luck to him,” said Janice Vincuilla. Moustafa Ismail has lifted as much as 600 pounds but said he doesn’t typically focus on how much weight he is hoisting. “It’s not about me lifting heavy weights,” he said. He has a daily exercise regime of 5 a.m. until 8 a.m. during which he concentrates on cardio, strength-training and body sculpting, using heavy and light isolated weights.